What stops us from thinking strategically? #1. Resources—most people simply don’t have enough time to get things done and in many cases, the organization doesn’t support people taking time out to think. We’ve replaced the Gordon Gekko Wall Street motto “greed is good” with “speed is good.” The problem is, we’re so rushed doing things, we’re often doing the wrong things–things that simply don’t make a real difference to the business. Research from the Economist Intelligence Unit shows that on average, 80% of senior management’s time is spent on issues that account for less than 20% of a company’s long-term value. If we don’t regularly schedule blocks of time to think about the business, both individually and in groups, we can’t expect to significantly grow the business. #2. Tools—a number of groups I’ve talked to use only one tool to develop strategy. Using only one tool, such as a SWOT Analysis to develop strategy is like playing 18 holes of golf at Pebble Beach with just a putter. Yes, it can be done. But you’ll be much more successful using a full bag of different clubs. The same is true for strategy development. There are more than 40 models we can use to catalyze our strategic thinking. The challenge is picking the ones that make the most sense for our business. And #3 Skills. 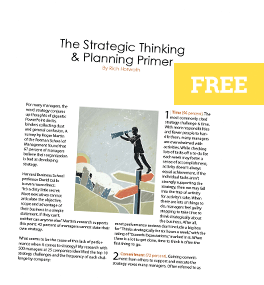 90% of managers have never had any training on strategic thinking. As Clayton Christensen, a professor at Harvard Business School has written, “Strategic thinking is not a core managerial competence at most companies.” We tend to invest in areas like presentation skills, customer service, consultative selling, etc. When is the last time your group invested in developing strategy skills?